Consider, for a moment, the lowly penguin. Each Spring they look for a rocky place where they can nest. Such a place is called a rookery. 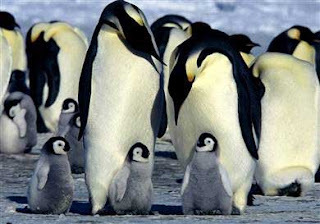 Large numbers of penguins lay their eggs and raise their young there. The rookery is very crowded. Up to a million penguins can live in single rookery, but each penguin has her own nest. If thousands upon thousands of penguins live in one spot how can a penguin tell which babies are hers? After all, they are all dressed alike. Each penguin has a different voice. The parents can pick out their own children from thousands of others just by the sound of their voices. They know their own children, and take care of them. In the same way, millions upon millions of people are scattered all over the world, but God knows those who belong to Him -- those who have trusted Jesus as Savior. Dear Lord we are thankful that You know us. We pray that we will always be aware that you are there and want the very best for each of us. In Jesus’ name, Amen.